Yeah, you do need special glue. The pipe is so cheap, why not just get a longer piece and jam it in? It can't slip out when the pipes are in use and it is a tight enough fit that it won't slip out during transport. You've got a point there young Chris. My wife and I just got back from 3 days camping at Honeymoon Bay. It is a great spot and will make an excellent base for exploring JB. The Navy operate the campsite and it seems better equipped than National Parks, with lots of Portaloos scattered throughout the large campsite. There are campsites very close to the easiest launch spot so we can drag the AI’s straight into camp on carts. 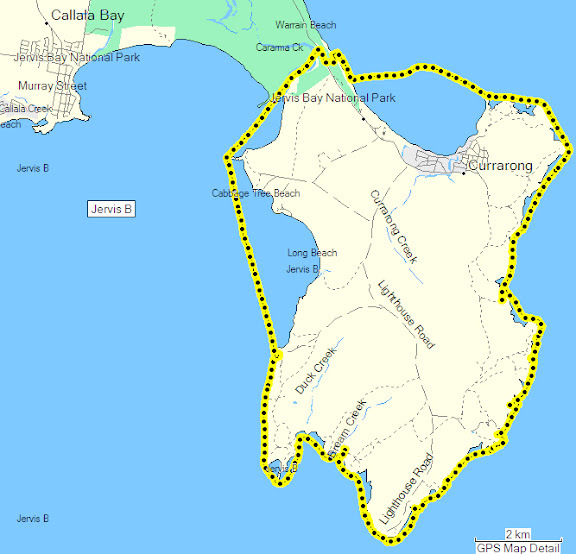 Drive to Currarong (leaving one vehicle behind) and launch from boatramp (easy) for trip around Beecroft Peninsula and back to camp (weather permitting). Pick up vehicles later. In relation to dragging our AIs to launch, which wheels are most suitable?? Save some jokes for the trip Mickey. Thanks for the photos Stringy. This is all look'n really good. But how do I know the place isn't really a hole, and you haven't just Photoshoped the empty beer cans and litter out of the photos ? For this trip I only had the new Trax2 and the balloon wheels worked well. The heavy duty wheels would have worked OK. There was a small section of soft sand similar to our Shoal Bay launch. My original Trax1 wheels which had previously let me down, didn't on our SB launch. I had filled them with that green liquid tyre sealant and it seemed to work. The heavy duty wheels are available from Hobie. A similar product is made here by Fallshaw and available from Reflex Engineering for around $35 each. They are very good quality. You need the 1/2" hub model. It is car camping at HB which is a bonus as our AI's should be a lot lighter! There were even unpowered caravan sites. I use an Aux battery for lighting and just the car battery for the washer. Definitely no rubbish there. I counted at least 6 commercial skips kindly provided by the Navy! Stringy - 1/2" hub model I guess that's for correct axle diameter?? Do these wheels have pneumatic tyres or are they solid? Do you know how many models they make? I have had a look at their web site but it's pretty general..Did you deal direct with them and order over the net? It would be good to be able to see one. I presume they don't have bearings and will fit on the original Trax cart OK?? Thanks CGM. The more information we get on the place, the more I want to stay longer. Dunno how we are going to fit it all in. May have to do 1/2 now and 1/2 in 6 months time. Are you com'n as well ? Come on mate, you must have a couple of sickies owing. I've just discovered that Fallshaw don't actually have a 1/2" bore hub. The wheels are FA 350X4DMD-PW and are $35 each. The simplest, though more expensive solution, would be to get the Hobie Heavy Duty Upgrade Kit 80043 and cut down the supplied bushes. This is what I originally did. Hey fellas, if you go up to CGM's thread with the circumnavigation link, that may not be a bad idea. On Google Earth the crossing would only be about 200m. Just have to get through the bush on the northern side but could be worth a thought. When we are driving there it may be worth stopping at that point and seing if it's do-able. If so that would make it about a 35km trip. Last edited by Slaughter on Thu Apr 22, 2010 8:20 pm, edited 1 time in total. Thanks Stringy - did they mail them to you? Funny thing - I've just returned from BJ Bearings in town. I seem to be making a visit there once a day lately. I expect I'll be able to get the bearings there OK. They also keep heavy duty wheels without bearings that are used by local boat shops to launch and retrieve. Only trouble is they are much too large for our needs.